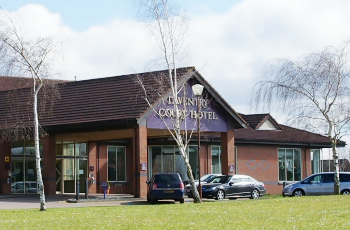 The 4NCL (Four Nations Chess League) Team and Individual Rapidplay tournaments, now almost the traditional curtain-raisers to the new British chess season, were held at the Daventry Court Hotel over the weekend of 4-5 October 2014. Twenty-seven teams took part in this seven-round event, played over four boards with squads of up to six players, on the Saturday. Some creativity was put into the names of teams, which, as is usual in the 4NCL, did not necessarily relate to geographical entities. For example, we had ‘West is Best’ (although, as it turned out, they weren’t) and, confusingly, both ‘Witney Brown Jack’ and ‘Brown Jack Witney’. I’ve no idea whether this is some weird West Country joke, or a more serious political schism akin to the fictional one dividing the ‘Judean People’s Front’ and the ‘People’s Front of Judea’ in the film ‘Life of Brian’. We also had Sons of Anarchy Grantham 1 and Sons of Anarchy Grantham 2, though I feel the second team might have been more logically labelled ‘Grandsons of’, etc, etc. Quite what the late prime minister Margaret Thatcher would have made of the link between her home town and these chess-playing advocates of lawlessness one can’t quite imagine. However, it has to be admitted that they were a formidable band of players and in the end it was only their own self-inflicted act of anarchy (the second team beating the first team, with Messrs Peter Batchelor, Liam Varnam and Guy Batchelor beating IMs Ameet Ghasi, Tom Rendle and Peter Roberson respectively) that prevented the first team clinching the championship. There is a moral lesson there for us all, I think. Joking apart, I should add that the Anarchy second team also scored a quite astonishing victory over a strong Barbican 1 side, with three players, Ben Purton, Liam Varnam and Guy Batchelor, all making light of 30+ grading differences (that’s something in the region of 250 rating points for the benefit of non-English readers) to score wins and contribute to a 3½-½ scoreline. Impressive. I suspect Mrs T would have approved rather more of the law-abiding Home Counties side from Guildford, who went on to win the championship, though only by the narrowest margin following a four-way pile-up on 18½ game points out of a possible 28. The other three teams in tie-break order were Sons of Anarchy Grantham 1, Barbican 1 and Barbican 2. Guildford squeaked through on match points, while SOAG 1 and Barbican 1 could only be separated into second and third places on sum of opponents’ match points. The time control was ten minutes each per game, with ten-second increments per move, and of course this brisk pace brought about a good many surprise results along the way. We had 12 electronic boards to capture the moves: this was fortunate for us spectators, but perhaps less so for some of the players. One particularly gruesome error may hang round the neck of the perpetrator like an albatross. In round two an unfortunate FIDE master managed to get mated in fewer moves than there are letters in his surname. I wonder if that has ever happened before. J.Hall - P.Poobalasingam: 1.e4 e5 2.Nf3 d6 3.d4 Nd7 4.Bc4 Be7? Already a serious error but one which appears more than 300 times on Mega Database 2014. 5.dxe5 dxe5?? Black has to pretend it’s a pawn sac with a bluff like 5...Nb6. If 5...Nxe5 6.Nxe5 dxe5 7.Qh5 wins material. 6.Qd5 That’s effectively game over as Black can’t usefully defend his f7-pawn. 98 Black players on the database reached this doleful position. Eight of them were higher rated than the player in this game. Six of them resigned immediately, while, of the other 92, one managed to draw and three went on to win. You may take it as read that the standard of opposition in those games was not high. As Bent Larsen once put it, databases are collections of bad games. 6...Nb6 7.Qxf7+ Kd7 8.Nxe5+ Kd6 9.Bf4 Nxc4 10.Qd5 mate. Ouch. I feel a bit guilty singling out poor Peter Poobalasingam in this way – there were a good many other ‘blunderful’ games I could have chosen. Quite a high proportion of rapidplay games, even those played by players well in excess of 2200, do seem to be decided by major blunders. As already mentioned, 2013/14 4NCL champions Guildford didn’t have everything their own way despite boasting a fine six-player squad: Australian GM David Smerdon, English GM Glenn Flear, IM Gavin Wall, promising junior Matthew Wadsworth, WIM Christine Flear and manager/captain/sponsor Roger Emerson. Christine Flear was downed in the first round by Guy Moss of Barbican 3, while they could only muster 3-1 against Witney Brown Jack in round two. Another 3-1 win followed in round three against Metropolitan Police, with Glenn Flear being found guilty of criminal damage in the endgame and taken into custody by Chris Briscoe of the Yard. The fourth round was even tougher, only winning by 2½-1½ against Leeds University Old Boys, with boy wonder Matthew Wadsworth losing to Simon Deighton. They won by the same score in round five against Barbican 2, but worse was to befall them in round six, losing 1½-2½ to Sons of Anarchy Grantham 1. Glenn Flear and Gavin Wall both lost, to Tom Rendle and Peter Roberson respectively. Here’s a game from the Anarchy showdown in which the two players lived up to their team name. So, going into the final round, SOAG 1 and Barbican 1 were leading on 16½, with Guildford on 15½, SOAG 2 & Leeds 15, and Barbican 2, RSJ and Millfield on 14½. The good news for Guildford was that the top two were paired against each other, while they had to take on SOAG 2. As it turned out, the top two drew 2-2, so Guildford were able to get alongside them with a 3-1 win. The last game to finish was David Smerdon’s nail-biting endgame win against Peter Batchelor. 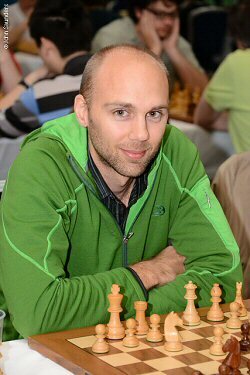 The latter came close to making a draw in the endgame – Glenn Flear pointed out his missed chance immediately after the game – but the genial Aussie, in an appropriately baggy green top, brought home victory for Guildford. Final scores: 1 Guildford 18½ game points (12 match points); 2 Sons of Anarchy Grantham 1 18½(11); 3 Barbican 1 18½(11); 4 Barbican 2 18½(9); 5 Leeds University Old Boys 1 17½(10), etc. Other prizes. Under 175 Grading: Leeds University Old Boys 2 on 14½. Junior: KJCA Knights 14. The next day 75 players lined up for the 4NCL Individual Rapidplay Championship, also over seven rounds and at the same time control. Three GMs, David Smerdon, Glenn Flear and Matthew Turner, were amongst the competitors, and two of them were at the head of the table when the music stopped. David Smerdon started with a smooth and impressive 6/6 and was able to draw with White against his only rival Glenn Flear, to clinch the tournament in the final round on 6½/7. Glenn Flear finished second on 6/7 on tie-break from 185-graded Peter Richmond, who finished with a remarkable 5/5, including the GM scalp of Matthew Turner. In 4-5th place were IM Ameet Ghasi and Roger Emerson (who also won his last five games) on 5½. Here’s Roger Emerson’s entertaining win in round six. Matthew Wadsworth defeated Matthew Turner in round two. The GM was guilty of overpressing but the younger player’s technique to exploit the lapse was impressive. The GM tries hard to win but only succeeds in ruining his own game. 1 David Smerdon (Guildford) 6½/7, 2 Glenn Flear (Guildford) 6, Peter Richmond (Brown Jack) 6. Glenn Flear was placed ahead of Peter Richmond on sum of progressive scores. U175 Grading: Stephen Whatley (Millfield) 5. Junior: Ravi Haria 4½. In an adjoining room at the Daventry Court Hotel, 28 four-player junior teams were taking part in a two-day five-round tournament. The 4NCL has long since ceased to live up to its original ‘four nations’ name but two nations were strongly represented, with seven of the 28 squads coming from Wales. The winners were Knights and Forks with 9 match points out of a possible ten, Chesspoint Northampton second on 8 and Welsh Dragons Yellow third on tie-break on 7.